If you are in need of sump pump installation in Rochester, trust the experts at GT Campbell Plumbing. We will start by helping you choose the unit that is best for your home. 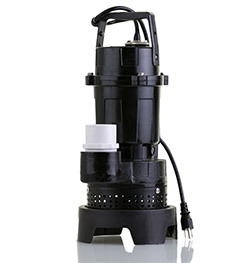 Sump pumps can be hard-wired into your electrical system or simply plugged into an electrical outlet. Most units have a battery backup to ensure that your pump will kick on when needed even if the power is out. A sump pump is basically a submersible pump. When water enters your basement or crawlspace, it flows into the sump pit. The sump pump features a float switch which causes the unit to turn on when water is present in the pit. The system then pumps the water out of your basement or crawl space. A sump pump only turns on when the water in the sump pit reaches a certain level. Most new Rochester homes have sump pumps, but we recommend adding them to older homes as well to prevent costly water damage. A sump pump is the solution to most basement flooding and leaking issues. The pump is typically installed in a sump pit, which is located in the lowest spot in your basement or crawl space, and removes water from your home automatically. You’ll also need to choose a pump that is properly sized for the space and can handle the job. Our technicians will help you decide on the sump pump that is best suited to your home and your specific needs, and thanks to our professional sump pump installation in Rochester, you’ll never need to worry about flooding in your basement or crawl space again. Whether you’re thinking about getting a sump pump for the first time or you are in need of a new unit to replace your existing pump, let the experts right here at GT Campbell Plumbing help. We proudly offer comprehensive sump pump installation, repair and maintenance in Rochester and throughout Monroe County. For fast and affordable sump pump installation in Rochester, call your trusted plumber in Rochester NY today.